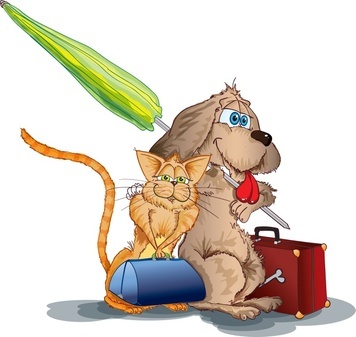 Of course you want to take your dog or cat on holiday - pets fret when separated from their owners. This site will help you find a pet-friendly holiday let so that your best pal come go on holiday with you and be welcome. Click on the titles on the left to help find a suitable holiday let for you and your pet. Do contact the owners of the holiday let you're interested in advance to find out what provisions are made for your dog or cat and what rules apply. The rules are generally simply commonsense and applied to protect the holiday let and environment. Read the 10 questions that you should ask before booking a dog friendly holiday letting. Pets are not usually allowed to remain inside a holiday let alone whilst you sightsee or shop; your pet must go with you or stay in the car. Check before booking if you hope to take more than 1 dog, there may be a limit and fees usually apply. Some holiday lets may provide kennels outside, dog beds and other doggy equipment. We hope that you find suitable pet-friendly cottage holidays for 2017 and beyond.